Is Sprawl Killing Your Data Center? Sprawl can strike fear in the hearts of IT administrators everywhere. Adding resources to meet reactive business needs can create sprawl. On top of that, if the infrastructure is already siloed, adding more just complicates day-to-day operations and management, often forcing IT to buy more tools and waste more cycles. How have some companies’ IT teams been able to keep up with the demands of their business? New innovations have helped them be more flexible and modern. Their IT has grown ahead of silos and better managed sprawl. They have built a dynamic infrastructure that adjusts to applications and workloads. These Modernized companies have adopted Intelligent Automation, helping them to be more efficient and manage their data center easily. How significant is easier management for modernized IT organizations? 76% of modernized IT organizations using modular server infrastructures believe those servers are improving ease of management. They also report reducing server administration time by a third, on average. Recently, Dell EMC introduced the kinetic infrastructure as the IT solution to quickly adapt to new workloads and demands. The Dell EMC PowerEdge MX modular server is the first kinetic infrastructure solution to help companies become Modernized. It also brings along simpler management, built with intelligent automation. The Dell EMC OpenManage Enterprise – Modular Edition (OME-Modular) is the powerful, built-in management platform for PowerEdge MX to meet the needs for growing businesses. A modular server platform has many components but each one is designed to talk with each other. Further, management that is optimized for modular servers ensures admins have full insight into everything inside the modular infrastructure. From installation to deployment and configuration, innovative management speeds up these repetitive cycles, while providing non-stop monitoring, alerting and sustaining operations. Made for PowerEdge MX servers, OME-Modular delivers an agile and comprehensive platform to manage modular servers, storage and networking. Now, IT can react faster to address new business demands, automate tasks, and use only one tool to reduce sprawl and underused resources. Use a single interface and console to manage compute, storage and networks, making IT Teams more effective. Reduce staff’s learning curve, the need for multiple tools and wasted effort. Reduce repetitive tasks with simplified administration. Respond quickly to alerts. Secure operations, updates and management to protect servers while lowering costs and risks of downtime. Roll out changes and templates faster across multiple PowerEdge MX servers with agile, intelligent automation. Expand reach and function with a RESTful API to automate tasks and roll out applications faster. OME-Modular also lets IT manage the PowerEdge MX at-the-box as well as remotely, thanks to the built-in Quick Sync 2 feature. 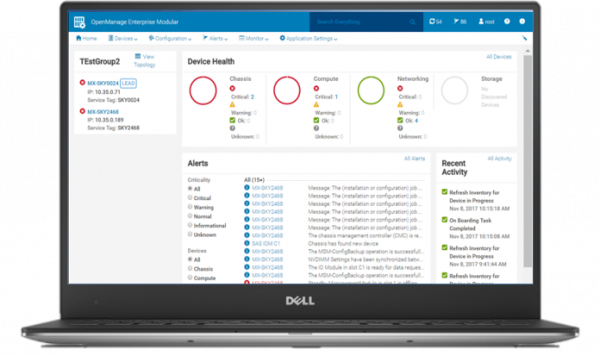 You can access servers remotely with the Dell EMC OpenManage Mobile (OMM) application, installed on handheld wireless tablets or mobiles. With Quick Sync 2 and OMM, IT can easily configure PowerEdge MX nodes, view system logs and address any alerts at-the-chassis. Lastly, PowerEdge MX also offers a touchscreen LCD panel option which speeds up initial setup and resolving alerts. OME-Modular makes it easy for IT to extend management and speed up server deployment across one or many PowerEdge MX groups, thanks to templates and server profiles that automate installs. IT can deploy new resources quickly, reducing repetitive cycles and wasted time configuring. In some cases, adding new servers into a larger managed pool can often lead to more silos and complex operations if management tools do not talk to each other. OME-Modular helps IT overcome these issues with a set of RESTful APIs that extend MX management. Data centers using Dell EMC OpenManage Enterprise share a common code base as OME-Modular, letting IT easily manage PowerEdge MX with only one tool and one interface. In fact, OpenManage Enterprise helps IT manage all PowerEdge servers, or up to 8000 devices. Reducing the number of tools and learning curve means much less sprawl and wasted resources. In specific environments like Ansible, Microsoft and VMware, IT can easily extend management and streamline operations, thanks to Dell EMC Connections and Integrations. OME-Modular and the RESTful API reduces the number of tools needed to manage PowerEdge MX within your custom environment. Take back control and easily manage your data center with OME-Modular. Becoming a modernized IT organization can be easily achieved with kinetic infrastructure. Further, kinetic infrastructure management reduces silos, sprawl and wasted time. Managing PowerEdge MX isn’t complicated because OME-Modular gives admins unified control of resources, simpler administration, and faster operations, all from a single console. Manage more with less and redirect IT efforts to boosting business results with OME-Modular. Source: ESG Research White Paper “Insights from Modernized IT: Modular Compute can Have a Big Impact”, August 2018, URL.